So named for their bright, changeable colours, rainbow fish may puzzle you if you buy them when they're young, as they're very plain looking then. Bright colours develop in response to changes in social status, and with the onset of sexual maturity. 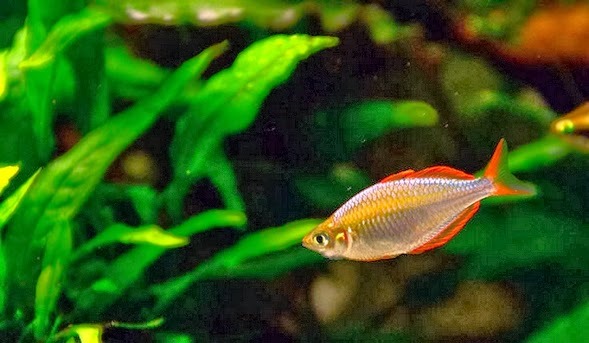 They are at their most vivid during spawning. Rainbow fish are happiest living in shoals of at least six, and this will bring out their colours. 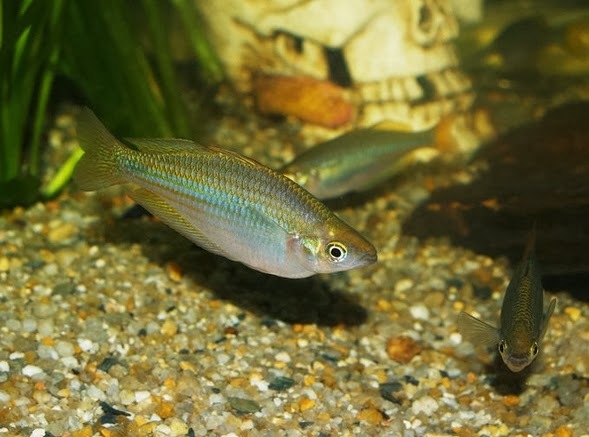 Although they will occasionally chase fish of other species, they have hardly ever been known to bite them, and they are generally peaceful fish who will get on with all kinds of other aquarium inhabitants. They're fast enough to be able to look after themselves in the presence of more aggressive fish, but do better if provided with plenty of hiding places, especially thickets of plants. Because of their speed you should make sure that they have plenty of open space to swim about.